Catalepsy with unilateral flexibilitas cerea. The patient, a 22 year old unmarried seamstress, shows the striking picture of catalepsy with unilateral flexibilitas cerea. Any one of the desired postions could have been given the left arm and leg, with no possibility of their voluntary adjustment by the obviously fully conscious patient. The depicted position held for over a half hour or more, thereafter the limbs slowly sank down by degrees. The patient was suffering from an insufficiency of the mitral valve and had become afflicted with a right lateral hemiparesis (with aphasia, which emerged after termination of the catalepsy) owing to a brain embolism. It was without a doubt, that consciousness had been clouded for only a brief time after the attack and showed no disturbance in the hospital in spite of the catalepsy which could be proven. 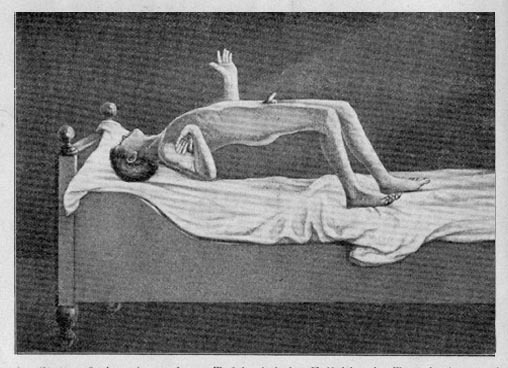 The cataleptic rigidity could be expressed only on the left side because of the complete palsy in the right half of the body. Incidently, unilateral flexibilitas cerea is repeatedly studied and has been described before, including that incurring with acute focal inflammation of a large brain hemisphere, always of course, in the unparalyzed half of the body only. Originally it was planned to have a table follow these photographs with the demonstration of a related condition: circle arch postion (arc de cercle) of a 12 year old youth afflicted with chorea major. Although there was not sufficient time for the copper plate reproduction of the recorded photograph, the case will still be presented, but as an autotype drawing in the text instead of a separate plate.